We are pleased to invite you to attend our training course for using ZF-HEALTH computation tools and resources, organized by the EU FP7 Integrated Project ZF-HEALTH "Zebrafish Regulomics for Human Health". The training course will be organized for three different groups of attendees willing to manipulate the functionalities of VIBE-Z, BioEmergences-WF and MecaGen respectively. We expect to discuss all the aspects of data acquisition, data management and data analysis relevant for building and using gene/protein expression atlases, digital cell lineages and cell shape segmentation, and mecanogenetic models of embryogenesis. We will also explore the relevance of combining the resources to investigate the dynamics of gene expression along the cell lineage and use this data to challenge theoretical models and their simulation. In association with the ZF-HEALTH workshop, the organizers are pleased to announce a one day symposium on Thursday 4th June 2015, you are cordially invited to (details of which will be announced soon). General information: The workshop is free of charge for registered participants. Accommodation costs will be covered by the workshop organization, but participants are responsible for their own travel expenses. The number of participant is limited and registration is mandatory. Participants will be selected on a first come first served basis up to 20 participants. Registration & contact: Please register by sending the completed registration form to Jana Maier (jana.maier@kit.edu). Accommodation & Symposium on June 4: We have booked rooms in three hotels. Please indicate your requirements on the registration form. Please, specify as well if you would like to attend the symposium on June 4. PhD positions in bioinformatics ("Rapid identification of ENU mutants by HTS sequencing") and molecular biology ("RNA editing in skeletal muscle during development") are currently open in the groups of Robert Geisler and Uwe Strähle as part of the ZENCODE-ITN training network. The immune system is one of the fastest-evolving biological processes, and it has become clear that all kingdoms of life, bacteria, plants and animals, have developed their own forms of adaptive immune system. Within the animal kingdom, genome analysis suggests that all vertebrates have rearranging molecules in the form of T- and B-cell receptors. However, the precise nature of the T and B cells in which these receptors are expressed is known only in human and mouse. Using the power of high-throughput single cell transcriptomics, we can now discover the cellular landscape of the adaptive immune system in model organisms ab initio. Here, we propose to profile T cells in a lower vertebrate, in order to gain insight into the origins of mammalian adaptive immunity. We will begin by profiling T cells in the zebrafish, a genetically tractable vertebrate model organism that is increasingly emerging as a model for immunity and disease (Tobin et al., PLOS Pathog., 2012). Initially, we will focus on CD4+ T helper cells, which are white blood cells that initiate the body's response to infections, and are an essential part of the human immune system. T helper cell subtypes (e.g. Th1, Th2, Th17) have been well characterised in higher vertebrates and can be distinguished by the specific interleukins that serve as activators, repressors or products of these cell types. However, the presence and identity of T helper cell subtypes in bony fish is still an open question. Through computational analysis, we have identified several of the interleukins and their receptors in zebrafish, suggesting that most genes characteristic of T helper cell differentiation are present. In particular, we have compiled evidence of IL1, IL4, IL5, IL6, IL10, IL13, IL17, IL21, IL23 and IL27 based on the literature (Secombes et al., Dev. Comp. Imm., 2011; Laing and Hansen, Dev. Comp. Imm., 2011) and gene prediction. Moreover, synteny and the presence of their receptors indicate that IL2 and IL33 could also be present in zebrafish. We will answer this intriguing question through massively parallel single cell RNA-sequencing of cells from existing Tg(lck:EGFP) and custom Tg(cd4:EGFP) zebrafish reporter lines, as well as FACS-sorted CD4+ cells with a new commercially available antibody. These experiments will provide a rich data set to mine bioinformatically, and gain unparalleled insights into the evolution of immunity. The project will benefit from combined expertise of the Teichmann group in single cell RNA-sequencing (Brennecke et al., Nat. Methods, 2013; Mahata et al., Cell Reports, 2014) and the Cvejic group in zebrafish biology (Cvejic et al., Nat. Genet, 2013; Bielczyk-Maczynska, PLOS Genet., 2014, in print). It will involve a combination of in vivo zebrafish experiments, genomics and bioinformatics methods. The deadline for applications is Friday 15th August 2014. Interviews are likely to be held in late September or early October 2014. The fellow would be expected to start in late 2014 or early 2015. The new website of the European Zebrafish Resource Center (EZRC) with a searchable catalog of fish lines is now publicly accessible at http://ezrc.kit.edu. Our zebrafish stock collection contains several thousand mutations from the laboratory of Christiane Nüsslein-Volhard (Tübingen I, Tübingen 2000 and Tübingen EU screen) and from the Sanger Mutagenesis Project (starting with library SL4) as well as transgenic and wildtype lines. Additionally we offer plasmids, sequencing services, genetic screening of Sanger mutations, and chemical screens. We would like to welcome applications to the EMBO zebrafish workshop that will take place at KIT, Karlsruhe (Germany) in the fall of 2013. The objective of this EMBO Workshop is to provide theoretical and practical background on the zebrafish model system for direct assessment of open questions using modern microscopy techniques. We encourage you to share the information on the EMBO course among potential applicants, aiming at experiencing the latest microscopy techniques to study development of nervous system using zebrafish. We look forward to meeting you during the course. Registration Submission Deadline: 15th June 2013. ZF-HEALTH is proud to announce the workshop on "Zebrafish Models in Translational Medicine" which will take place in Courcelles-sur-Yvette, France, on October 2-4, 2013. This international meeting is co-organized by the EU FP7 Integrating Project ZF-HEALTH "Zebrafish Regulomics for Human Health" and the European Society for Fish Models in Biology and Medicine “EuFishBioMed”. The aims of the meeting are to provide a stimulating debate on the current knowledge and approaches relevant to long term human pathologies, thanks to the contributions of renowned experts in the medical field; and to pave the way to novel approaches and collaborations using animal models. Within the past decades, advances in understanding the biology of long term human pathologies have been made possible in large part thanks to the development of molecular genetics and cellular biology tools. In a parallel way, the emergence of new animal models, such as zebrafish, has allowed to develop in vivo paradigms for human pathologies, based on the conservation of the genome and the particular technical qualities of the model, including easy in vivo imaging, embryo/genome manipulation and simplified large scale chemical/drug testing. We look forward to seeing you at the meeting in October. Spaces are limited, so please register soon to avoid disappointment. Herman Spaink (University of Leiden, NL), Uwe Strähle (KIT, Karlsruhe, Germany), Jan de Sonneville (Life Science Methods BV, Leiden, NL), Christian Pylatiuk (KIT, Karlsruhe, Germany). This workshop will be held at the Møller Centre, University of Cambridge, UK between 10-11 December 2012. Please note that the deadline is extended to November 23, 2012! Zebrafish are considered ideal model organisms for biomedical research. Zebrafish share most organ systems with humans. This makes them ideal model organisms to study the causes of human diseases like cancer or heart diseases. For this purpose, research needs a variety of zebrafish lines. With the European Zebrafish Resource Center (EZRC), Karlsruhe Institute of Technology (KIT) is now opening the first central repository for such lines in Europe. The EZRC is funded jointly by the Biointerfaces programme of the Helmholtz Association and the Klaus Tschira Foundation. The Klaus Tschira foundation provides a funding of 1.5 Million Euro over three years. Representatives of the media are cordially invited to come to the official opening on Wednesday, July 18, 11 hrs on KIT Campus North. Moreover, their eggs are transparent and develop outside of the body of the mother. This allows researchers to observe the development of organs or even individual cells in the embryo as well as in the larva, which is also transparent, without harming adult animals. Such experiments may replace numerous animal experiments with rats or mice. The fish are ideally suited to studying the causes of cancer, heart disease, and behavioral disorders and to evaluating potential drugs. In recent years, laboratories in Europe alone have generated thousands of zebrafish lines, each of which carries either a particular mutation that can serve as a model for human disease, or a fluorescent marker that labels a particular tissue. However, European researchers have been lacking a central repository to store and distribute these fish. The European Zebrafish Resource Center will meet this need in the future. 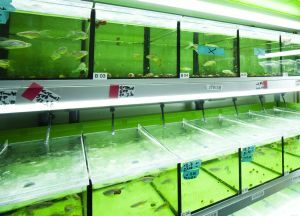 The EZRC has over 3,000 aquaria for keeping live fish as well as freezers capable of holding about 80,000 sperm samples. The EZRC will also be the first zebrafish screening center worldwide, welcoming guest researchers who will perform systematic research on its collection. The scientists will be provided with technologies such as high-throughput synthesis of drug candidates, genome sequencing, and robotics and software developed in-house for sample handling, microscopy, and image analysis. The EZRC will also be the central hub of ZF-HEALTH, a recently started collaborative project funded by the European Commission’s 7th Framework Programme. The grand opening ceremony of the EZRC will take place on Wednesday, July 18, 11 hrs, at the Leibniz Saal of the Fachinformationszentrum (FIZ) on KIT Campus North (building 240, Hermann-von-Helmholtz-Platz 1, 76344 Eggenstein-Leopoldshafen, Germany). All presentations will be given in German. The Klaus Tschira Foundation (KTS) supports natural sciences, mathematics, and computing and wishes to further promote work in these areas. This is a federal undertaking that starts at the kindergarten level and continues through to schools, universities, and research institutions. The photo of printing quality may be requested by presse∂kit edu or phone: +49 721 608-47414. The press release is available as a PDF file. On 01 November 2011 I am moving to Imperial College London (joint position with MRC Clinical Sciences Centre), together with part of my current group. We have four vacant positions in London, all on very exciting projects, and I would be very grateful if you could help me spread the word so I could fill them with the best possible people. junior postdoctoral researchers on "Cutting Edge Technologies in Biomedical Research", to be held on May 4-6, 2011 - Karlsruhe Institute of Technology (KIT), Germany. Topics will include: High-throughput screening, 3D imaging, next generation sequencing, database resources, zinc finger nuclease knock-out, research management and ethics. Speakers: Randall Peterson, Cambridge MA; Stefan Schulz, Karlsruhe; Holger Erfle, Heidelberg; Markus Reischl, Karlsruhe; Michael Boutros, Heidelberg; Jochen Wittbrodt, Heidelberg; Lars Hufnagel, Heidelberg; Clemens Grabher, Karlsruhe; Urban Liebel, Karlsruhe; Ferenc Mueller, Birmingham; Uwe Straehle, Karlsruhe; Boris Lenhard, Bergen; Lars Juhl Jensen, Copenhagen; Keith Joung, Cambridge MA; Tim Frayling, Exeter; Didier Stainier, San Francisco. General information: There is no registration fee. Accommodation costs will be covered by the workshop organization, but participants are responsible for their own travel expenses. Applications must include a short CV including publication list, a brief statement of research interests and motivation for wanting to participate in this workshop and a supervisor's letter of support. Up to 30 participants will be selected by the ZF-HEALTH Consortium, half of these places are reserved for ZF-HEALTH participants. The deadline is now extended to March 27, 2011. The ZF-HEALTH project website, http://zf-health.org, is now publicly accessible. An archival version of the preceding ZF-MODELS website remains available at http://zf-health.org/zf-models/. To mark the start of the ZF-HEALTH project, a kick-off meeting was held in Bad Herrenalb in the Black Forest on July 24 – 25, 2010, hosted by the Karlsruhe Institute of Technology. The meeting was attended by 22 senior scientists reprenting most of the Consortium partners, and Prof. Monte Westerfield representing the Scientific Advisory Board. The agenda included a preview of the work to be performed in each of the work packages and discussions on strategies for mutants selection, phenotyping and chemical screens, as well as on intellectual property issues. The Consortium endorsed proposals to hold the first ZF-HEALTH workshop in Karlsruhe and the next project meeting in Zürich, in the summer of 2011.